To access vssadmin.exe we will have to open the command prompt with administrative rights. In order to do that, type "cmd" or "command" in the Start Menu search field. The first result should be cmd.exe or the Command Prompt. 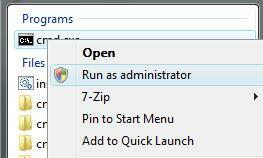 If you have UAC turned on, right click on it and select Run as administrator. The Command Prompt will open. The Volume Shadow Copy Service offers several configuration option. Type vssadmin /? and press Enter to see the list of available options. 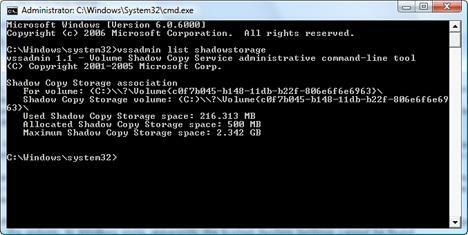 If you want to know how much space has been allocated and the maximum amount of space that can be used by System Restore, type vssadmin list shadowstorage and then hit the Enter key. MaxSizeSpec must be 300MB or greater and accepts the following suffixes: KB (for kilobytes), MB (for megabytes), GB (for gigabytes), TB (for terabytes), PB (for petabytes) and EB (for exabytes). If a suffix is not supplied, MaxSizeSpec is in bytes. If MaxSizeSpec is not specified, then there will be no limit to the amount of space it may use. The maximum space used by System Restore has now been resized. Please check the complete command line. If you have additional spaces it won't work. But it still says the same error. I assume it's me doing something wrong but for the life of me I just can;t figure it out! How do I clear the restore data? I have 15 gigs being used by this and shouldn't I delete the data before I resize it? Use the Disk Cleanup Wizard. Vista has reserved 60 GB and using all 60GB for system restore. disk space used by Vista for Restore files. if ever any user wants to see the folder size of all folders at a place use "Disk Size Manager" software. Useful article! Thanks. Worked well for me. I followed the instruction above, even got the confirmation of the resize. However, under the computer icon the D drive is still allocated almost 8g. I resized it to 2g? Suggestions? I think you followed the wrong tutorial. What do you want to do? Resize the "D:" drive or change the space used by System Restore? hi, useful article, but it didnt work for me the first time I used it. I tried to make it 3GB, but it wasnt having it. Soo instead I put 3000MB and it wokred like a charm - hope it helps! This article worked perfectly for me and I regained 50GB as a result. Thanks. I think I've got a problem. I did what you told me to do but I resized it to 2GB then I checked how much bytes it was using and realized that it didn't use much so I resized it again to 1GB then I checked it again and it said it was using 0bytes. I haven't restart my computer yet and I am just worried if I do will anything happen? I didn't create any system restore point yet... so please help me! Will anything happen to my computer? I just got 32GB back, thanks guys! Great stuff, works perfectly fine for me. It worked for me as well, thanks. great article! thanks and congratulations. worked great. "The specified volume shadow association was not found"
i had a space of around 40 GB under the system volume information. I kept it to a level of 10 GB. which i feel is big enough. thanks again. Great solution!!! I was burning my head over the 35 odd Gb's vista was eating up.. This helped me to regain it.. god article.. Thanks dude!! Is there n e harm ?? Thnx a million.. but if v reduce the disk space ... then is there n e harm to operating system.. like in future.. ?? All you are doing is limiting the amount of space that System Restore uses. The only thing you should not do is make it too small, as then you will not have any restore points. 300mb is the absolute minimum that it requires, so a size of 1gb or higher will allow you to have several restore points. At last I can stop System Restore eating up 100gb of space. My C:/ drive storage space was showing as UNBOUNDED, which would leave system restore use up all the space. I have now made it 30GB, which will leave me with plenty of restore points and also plenty of space on my C:/ drive. Many thanks for an easy guide. Thanks for the great tutorial..I have been searching for the reason behind my drive space usage problem.. I use Acronis True Image for weekly image backups as my main restore feature and before this tutorial my backups were huge..( almost 100 GB each ) Now I seem to have freed about 98 GB of hard drive space and hopefully my backups will be much smaller..
What are your recommendations for the "correct" size of the system restore space? It's good to know HOW to change it, but it might great to know WHAT to change it to. I've been rooting around in the interface of Vista for months trying to figure out a way to do this, and I'm no stranger to the command line, I just never knew about the command until now. Thanks for this! Windows was sucking up 7-9G every few days, then I'd clean it and regain the space only to find it used up again. We only have an 80G drive and store lots of pics and video, so this really helped a lot. I just hope it really does work. No items found that satisfy the query.? If you resize to a smaller value than your current used space, it clears all the restore data. i.e. : I had 4.776GB of 8.0GB of shadow storage used. I changed my Maxsize to 500MB. When I checked the space used it was 0. I can't find any information of how to change the allocation of storage. My allocated storage space is zero. Which is surely the reason System Restore is not working on my machine. I had over 185GB space taken up by shadow copies.. hardly had any drive space left at all. Maxsize was "unbounded". Vista was slowed to a crawl & I was getting disk space warning popups. Finally added myself to ACL on System Volume Information folder as I suspected it might be storing more than 15% ..
After vssadmin tips -- now back to having over 180GB free. Reset Perms on system volume information & now all is well. Excellent tip - thanks. Mine was set to 5GB... now set to 2GB so ive gained an extra 3GB outta this. Thankyou. i did'nt realise Vista used up so much disk space for back up or for windows it's self. Hopefully now i get get my laptop to work at something that resembles normal. Tree size free is a great liitle bit of software that breaks down how much a file on each drive is using disk space. I've been trying to change the space that system restore takes up, and now I did thanks to this. Now I have 5GB off my C: drive and it's running faster now. Again, thanks a lot. I am glad to be able now to increase my measly 300mb of Restore space to 1GB thanks to the vssadmin command. I only had like 5 restore points due to the limited space of 300mb, and since my Start Menu folders all disappeared the other day in Vista, I was outta luck. The Retore Points only went back a few days, so it dropped off a RP where I could have gotten my programs back in Start Menu (But that is another problem to try to solve somewhere else). Beware, the vssadmin with parameters to enlarge the space size, deleted ALL my previous Restore Points. Maybe that was mentioned in the article, but I didn't see it. I, too, had the problem of a disk partition filing up with System Restore points and shadow copies. It came out of nowhere after years of using this computer. This advice and the CSRF tool worked great. Thanks for solving my problem. I am running the command prompt as administrator. I'm completely sure I typed the command correctly. I tried it multiple times but it still won't work. I get an error that says "Error: The specified volume shadow copy storage association was not found." What should I do? Thanks for the guide. Very useful, I was able to change the maximum size. However, when I checked the current storage settiings, not only was I shown the maximum size, I was also shown the maximum allocation. The latter was set at 300MB and the former was set at 1GB. My question is how do I change the maximum allocation?